Apple has finally sent out the invite to its highly anticipated March 21st event where it is expected to announce a new cheaper variant for the iPhone lineup called the iPhone SE, a new iPad update to the iPad Air lineup that may contain the name ‘Pro’ in it and also a few Apple Watch updates most likely introducing new bands. 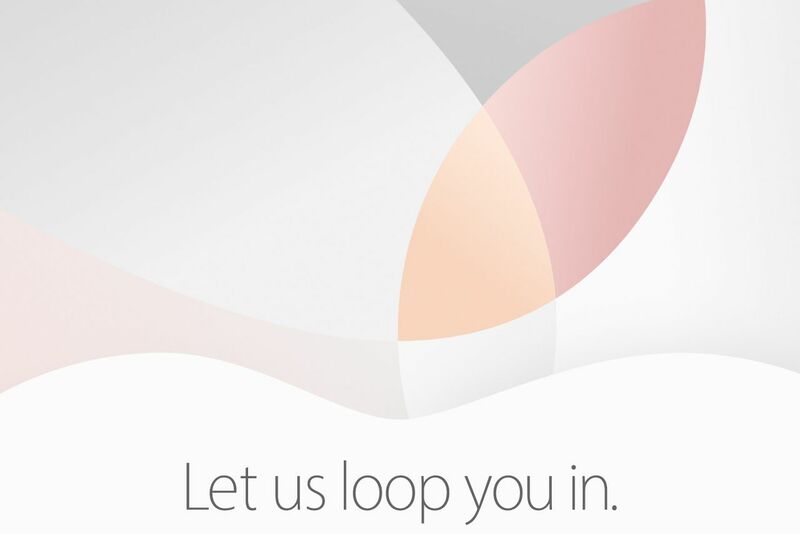 Apple’s tagline for the event “Let’s loop you in” could hint at the event being held at it’s famous One Infinite Loop campus or updates on its new Spaceship Campus which resembles a loop or could even point to an Apple product receiving a lanyard loop similar to the previous generation iPod touch. The Apple logo also resembles two premium colours Apple offers for its premium products, Gold and Rose Gold. This could point to the new iPad receiving a new Rose Gold colour option. The iPhone SE will be a cheaper variation acting as a successor to the iPhone 5c having the same dimensions as the iPhone 5 but bringing the same processor as the one in the iPhone 6s along with touch id capabilities, an improved 8 megapixel camera and possibly Apple Pay support. The new iPad is said to bring in support for Apple Pencil and Smart Keyboard using the smart connector, features that are currently only available exclusively to the iPad Pro. Apple may also introduce ‘Pro’ to the name of the iPad due to these additions apart from performance improvements. Apple is also expected to introduce dual stereo speakers on either side and even a true tone LED flash at the back for all those ‘tablet photographers’. The Apple Watch update is expected to bring in new bands and watch combinations. Apple is currently fighting an important case for privacy with the FBI. Click here to know more about the debate. Whether or not, Tim Cook will make a mention remains to be seen. When Apple showed off the iPhone 8 and 8 Plus at the 2017 Apple Special Event, it was quickly eclipsed with the announcement of the of the iPhone X and with good reasons. The world was highly anticipating a design overhaul of the iPhone marking its tenth anniversary and that is exactly what the X showcased. By the end of the Special Event, the internet was buzzing with iPhone X news that contained a variety of both positive and negative impressions of the device; the insanely high price tag of a $1000 and of course, the infamous notch that gave birth a galore of memes. The phone itself did not go for sale until late November with pre-orders overwhelmed within minutes leaving users with expected delivery dates until mid-December. Now that all the hype has settled and the market has been swarmed by a “top-notch” smartphone trend, it is essential to check on how well has it aged within the first six months.